ok, i have tried to make the rillettes look pretty in a picture. i said i tried. but boy is it yum. this recipe is a combination of a few i found, with added duck fat and the tea-soked prunes was from a pate recipe i saw somewhere. pour the tea over the prunes and allow to soak for an hour. put everything in a small covered braiser or casserole dish. put in the oven for three hours at 300f. take out of the oven, allow to cool to a reasonable temperature. remove the bouquet garni and bay leaves. pull the meat off the bones, discarding the bones. 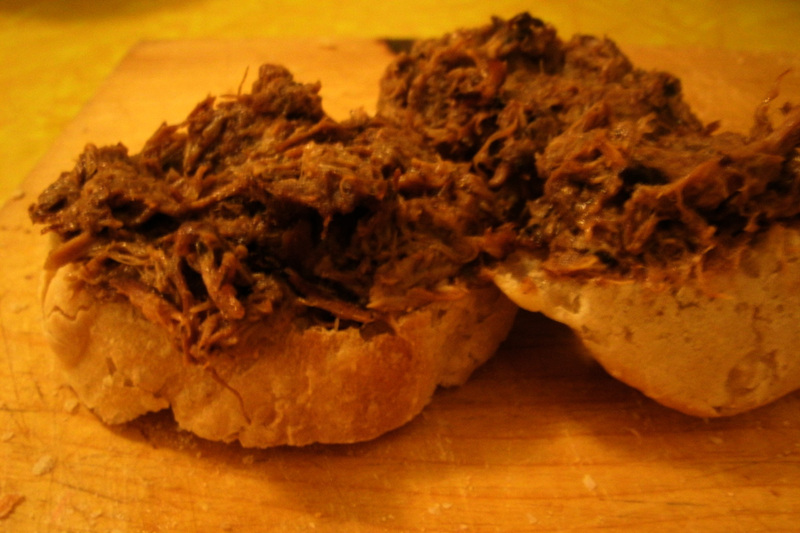 pull the meat into fine shreds (or pound in a mortar if you are so inclined), incorporating the cooking liquid. season to taste with salt and pepper. put in a small crock and chill overnight to let the flavours blend. allow to come to room temperature before eating with fresh bread. i make a lazy person's baguette by using the classic new york times no-knead recipe, only instead of leaving it in a lump on the counter after the first 14-hour rise, roll it into two logs and put them in a baguette tray to rise. some time before sticking in the oven for about 25 minutes at 425F, cut a few slits in the top.